"The clear and pristine design of this masterpiece of a dinning table reveals the fundamentals of nature and the genius of Italian design. Made in Italy, the Riddled Contemporary Designer Dinning Table has a graceful and powerful aura that reaches beyond its practical intent. Tracery and partitions, typical of the world renowned designer Steven Hall, come to life in this very unique furniture article. 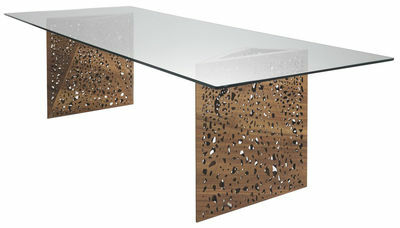 Riddled Modern Dining Table was designed in 2007 by Steven Holl for Horm. 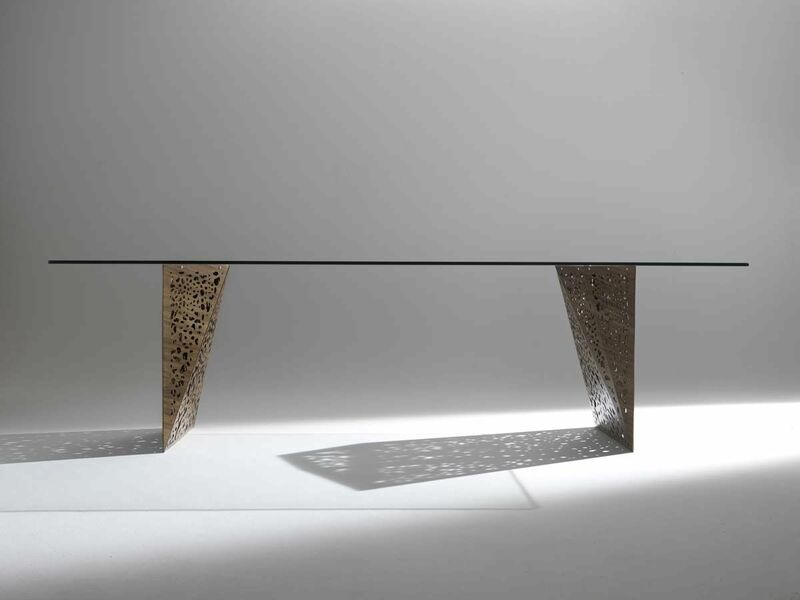 Different materials are integrated and combined into the shapes that make up the whole: the two table legs each comprised of a triangle of wooden stenciled veneer sheets, each different from the others in terms of size and shape and united by the same pattern which then fit together into an aluminum framework. 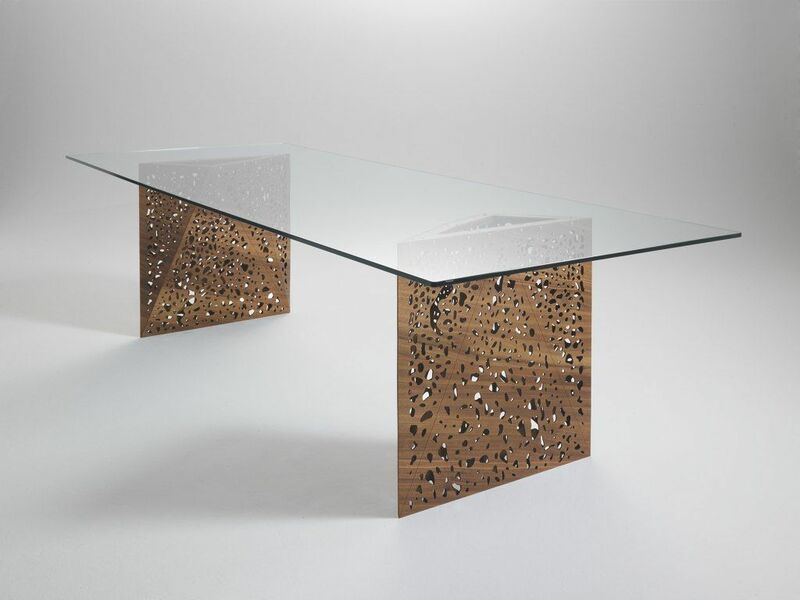 Production methods for this spectacular dinning table employ high technology where the thickness of the legs structure is about 0.09"" finished in walnut veneer and the table top is made out of tempered glass 0.5"" thick (available in two sizes). Incorporating technologically advanced methodology, the Riddled Contemporary Designer Dinning Table includes an optional lighting systems strategically positioned in the leg-base of the table. 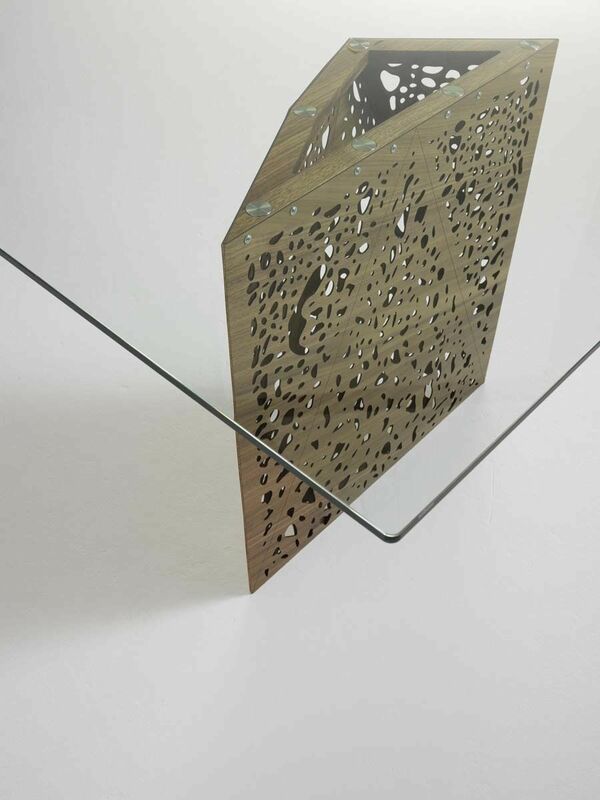 When lit, the Riddled Dinning Table projects enigmatic shadows through the stenciled pattern of the table legs onto the floor, and in turn envelopes the dinning room with ardent aura"